Samsung has announced a new agreement with streaming music service Spotify during its Unpacked press event. The partnership will allow Spotify songs to transfer seamlessly across Samsung Galaxy phones, tablets and smartwatches. It will also connect to Samsung smart TVs and the upcoming Galaxy Home smart speaker. Samsung has used its Unpacked press event for the Galaxy Note 9 to also reveal a new agreement with popular music streaming service Spotify. The partnership will give owners of Samsung’s various devices an easy way to both install and use the music platform. The new partnership includes not only Samsung’s various Galaxy smartphones, tablets and smartwatches, but also its smart TVs, Family Hub refrigerators and its upcoming Galaxy Home smart speaker. 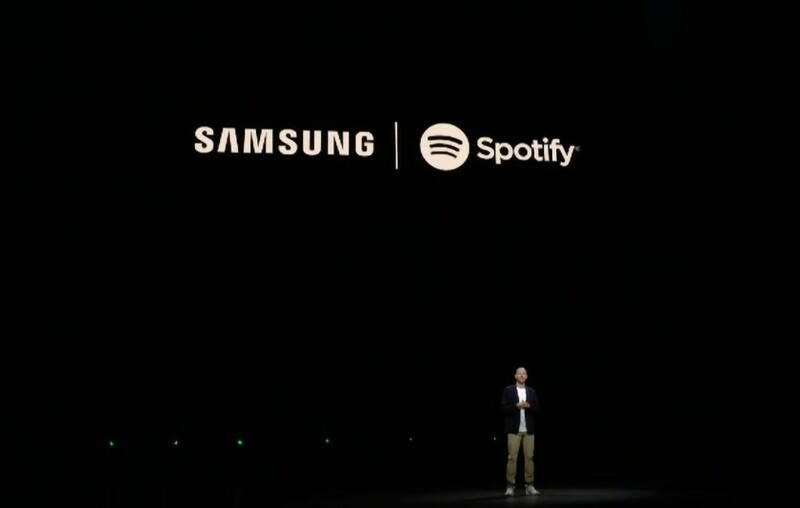 Speaking as part of the press event, Spotify CEO Daniel Ek stated the setup experience for new Samsung devices will now include access to the streaming service. Also, if a person owns multiple Samsung devices, they will be able to listen to a playlist on Spotify on one product, and then transfer it seamlessly to another. For example, owners of a Galaxy Note 9 can listen to a song while in the car, and then keep listening to it on their smart TV or the Galaxy Home speaker when they get home. In addition, the music platform says it will soon integrate the service deeply into Samsung’s Bixby digital assistant. That means if a person asks Bixby for some music, it will automatically look for the music on Spotify, even if the person doesn’t have a Spotify account. Samsung and Spotify didn’t reveal any financial terms for this new partnership. However, it would seem to be a good deal for Samsung’s side. You may remember that a few years ago, it tried to compete directly with the music platform with its own Milk Music streaming service. However, Milk Music only lasted a few years before Samsung shut it down in September 2016. This new agreement will make it easier for Samsung device owners to get the music they want without a lot of fuss, and Spotify has the chance to get some new people to try its service, as it continues to compete with its main rival, Apple Music.